The Georgia Mountain Storytelling Festival (Apr 12-13, Blairsville) is free for all local students! Join the free teacher workshop on Apr 11, 3:30-5:30pm. The 2019 Agnes Scott Writers' Festival is scheduled for Apr 4-5. 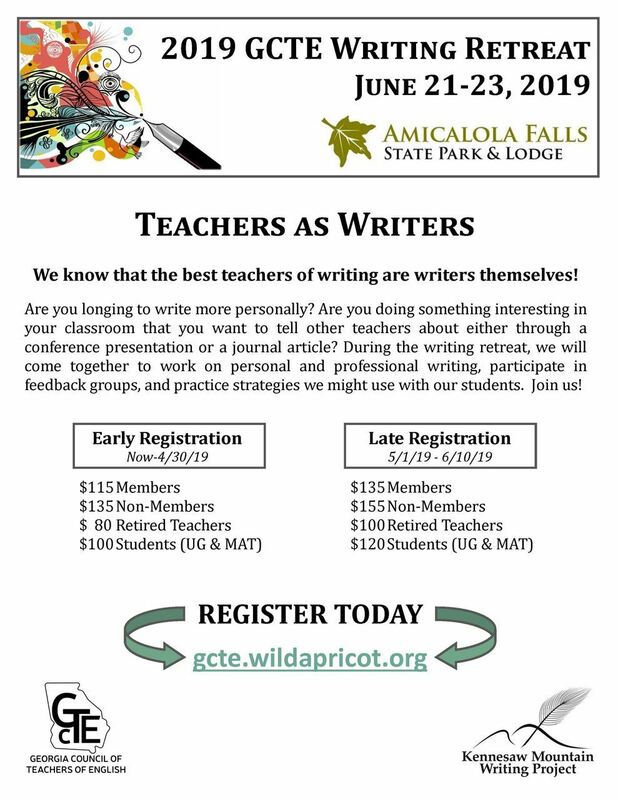 You can register now and book a room for the June writing retreat... and why not consider submitting a proposal to to be a session presenter? Read the Winter 2019 issue of Scribbles N' Bits. The Call for Manuscripts for the Summer 2019 issue of Connections is now available! Submit your work! Georgia's new Words2Reading offers free reading resources for teachers, families, and caregivers. Check out the Library of Congress Searchable Database of Primary Source Documents, organized by state standards, grades, and subject areas. Review the latest on Georgia's ESSA application, recently submitted. Georgia Partnership for Excellence in Education is a non-partisan advocacy group with a long history of support for public education in Georgia.